Essentially movie theater signage has become a customer service enhancement assisting theater guests in managing their theater visit. For a start, the theater marquee has became a critical component of a movie theater's front of building architecture to promote in big bold type the latest and the greatest movie titles of the day. On a smaller scale, to keep fans informed of what was yet to come, full color movie posters were printed and plastered throughout the theater and nearby town. Movie theater signage also incorporates way finding as well to direct audiences within the maze of hallways and various floors that make up a modern multiplex venue. Marquee message reader board appears as a single, large horizontal electronic banner that runs across and around the front of an over hanging movie theater marquee. The marquee functions similar to a 'news zipper,' whose 'headlines' would be a streaming list of the latest films within the theater. 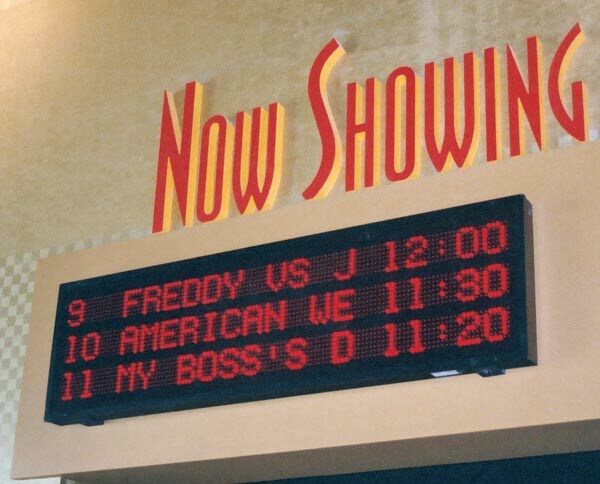 The need for different kinds of movie theater signage remains the same as always, but signage media has evolved from just print to its electronic or digital display counterpart. Every aspect of the movie theater's signage from the box office film availability and ticket price charts and auditorium film marquees to theater lobby advertising displays are now presented as digital dynamic displays. As movie theaters adapt electronic signage, two formats have become critically important, LED message reader board screens and plasma screens, each for a specific use, and each presented in this article by its major provider. Lobby reader boards are placed at varying parts of the multiplex and identifying auditorium number, film title and show start. In understanding the modern movie theater usage of LED signage, Rob Destefano, sales executive of Billboard Video's Multimedia Electronic Displays division (Rancho Cordova, CA), whose company has been offering reader board sign packages under their e-Cinema brand to film exhibitors since 1994, discussed the lineage and transformation of movie theater signage into its LED message reader board counterpart. Most major film exhibitors have several large multiplex sites with 10 to 15 or more screens per house. 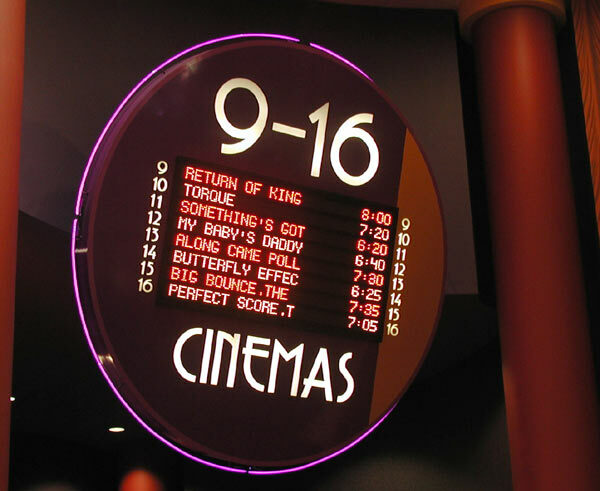 Prior to electronic reader boards, movie theaters use printed signage to identify which films are in which auditoriums which was known as "Title Art" (referring to the film title). The title art was actually a translucent Mylar strip that was manually inserted into a miniature sign cabinet (a 'mini marquee') directly over the entrance to the movie auditorium. Over the title frame was a second sliding track where different film start time-cards were slotted into the sign cabinet. To support that many screens with printed signage is costly (printing new title cards every month and replacing burnt out fluorescent lights). It is also very labor-intensive ordering all the different movie theater title cards, putting them up in their cabinets and changing them out with every new film title opening. With a multiplex having six to twelve auditoriums per venue, the labor efforts increase proportionally. In the scheme of refurbishing movie theaters, signage's transformation from print to electronic has become a significant customer service enhancement to movie theater guests in their visitor experience; and thus an important component to their theater operations. In doing so, the most visible electronic theater signage is its LED message reader boards which are not so much one or two signs as an entire sign package system that guides the theater customer from box office to the auditorium of their choice. For the large film exhibitors, says Destefano, "the implementation of LED messaging systems is now automatically applied to new movie theater construction. For older movie theaters where a refurbishing or "modernization" of a theater is in development, an electronic reader board system is seen as a viable necessity of a theater upgrade. The incorporation of electronic reader board signage is being done across the board from the major film exhibitors to the mid-range exhibitors as circumstances permit the signage to be added." With the thousands of theater patrons who converge on the multiplex during a Friday to Sunday attendance surge, the reader board system becomes an effective customer support component, letting patrons know up front: cost of film, availability or if it's sold out, and which auditorium it's playing in - all at a glance of the box office's main message center board. Following additional way finding signage would take patrons straight to their auditorium. Pricing out the cost of setting up a reader board system is an economy of scale depending on the number of auditoriums per multiplex and the overall amount of signage required to support a multiplex set up. 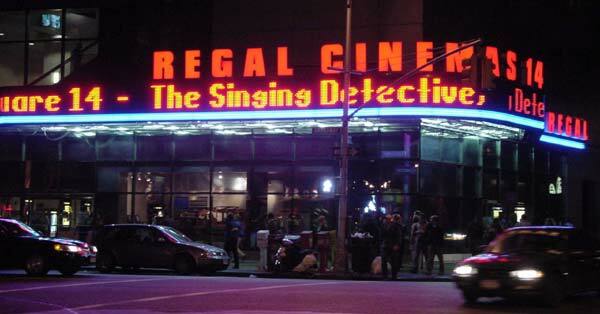 "If we were to take a smaller multiplex of five auditoriums," Destefano estimates, "representing a five-plex cinema, the incorporation of a single box office message center sign, software and five additional mini-marquee signs (one for each auditorium) would run approximately $5,000 - $10,000 for a complete e-Cinema package." 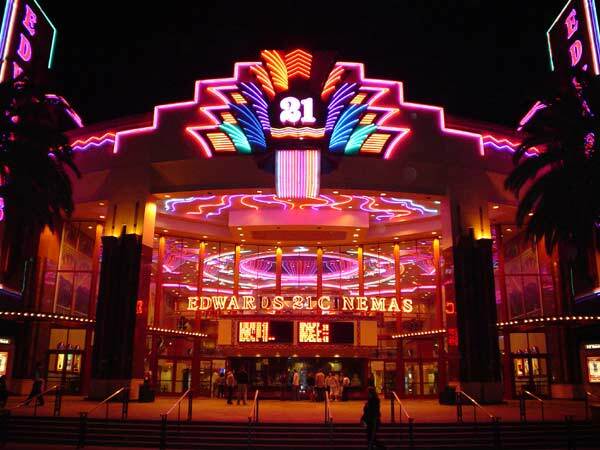 Edwards Theater 21 capped in a glorious neon facade, with open faced, interior neon illuminated channel letters. Directly below the channel letters is a full message center denoting feature film status and film availability for all films within the multiplex. In an effort to modernize multiplex operations, just about every film exhibitor has switched to LED messaging systems for major theater signage. In assisting in this modernization program, Billboard Video's Multimedia Division has already provided message reader board systems to many film exhibitors within the film industry of which a few include AMC, Regal Entertainment Group, Pacific Theaters, Century Theaters and Signature Theaters. This is a street side application of a single, large horizontal banner strip that would run across and around the front of an overhanging movie theater marquee. The strip would function similar to a 'news zipper,' whose 'headlines' would be a streaming list of the latest films within the theater as well as a rating value (PG, PG-13, R, ) next to each title. Imaginative theater managers could also attach short reviews (excellent film, four ****s, etc.) next to each film title. Located at box office where tickets are purchased, this display is usually presented behind and above the ticket sellers. The sign lists current films, ticket costs, time of next showing and film status (available vs. sold out). This sign is actually keyed into the box office's point of sales (POS) ticketing system, so when an auditorium is sold out, the message center status board will automatically reflect that change. More likely to be found in the bigger multiplex houses where the film auditoriums are spread throughout the theater facility, this sign unit directs movie patrons to where specific groups of auditoriums are located within the theater complex. This message reader board known as a 'mini-marquee' is assigned to each and every auditorium. Thus, a 12-plex would have twelve signs, each located in front of its own auditorium and indicating the film in current play, its start time and rating value (PG, PG-13, R,). Suffice to say LED reader board signage has become a critical customer enhancement component as to how film exhibitors now operate their theater signage systems. As electronic signage continues to evolve in movie theaters; other signage categories as well are also feeling the 'digital touch.' Here, the movie poster is slowly being replaced with a multi-purpose plasma screen showing off different advertising categories - all on one screen; including movie trailers, and concession and national brand advertising. In the forefront of electronic theater advertising is AdSpace Networks (Burlingame, CA), a leading builder of digital display networks. The company licenses its CoolSign software to third party advertising networks and also operates and sells advertising for its CoolSign Advertising Network, a nationwide network of digital displays located in high-traffic venues and available to local, regional and national audiences. AdSpace has established an advertising network relationship with national film exhibitor, Loew's Cinema Entertainment Corp. with plasma screen displays located in lobby and hall areas of various Loew's multiplex venues. 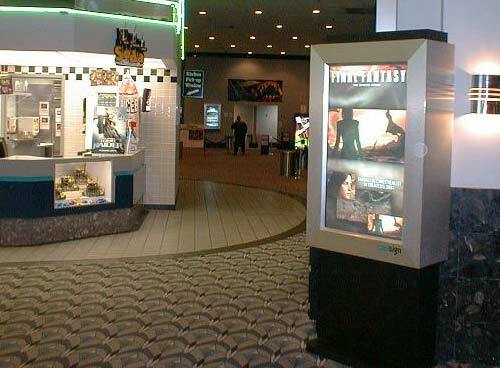 Within the last few years AdSpace has established an advertising network relationship with national film exhibitor, Loew's Cinema Entertainment Corp. To this end, AdSpace developed an advertising network consisting of plasma screen displays located in lobby and hall areas of various Loew's multiplex venues in New York City, Philadelphia, Boston, Chicago, and San Francisco, Las Angeles, Dallas and other major cities throughout the United States. Free standing. Each Loew's theater network display is synched to show the same three-to five-minutes advertising loop simultaneously. Display units can conform to different theater spaces by being hung on the wall or placed as free standing units. The CoolSign network was described by Sr. Vice President of Sales and Marketing, John Henderson, who noted that currently the company has deployed electronic screens in at least 50 Loew theaters with anywhere from two - four plasma screens per theater. Henderson observed that the presentation of electronic advertising in theater lobbies is an additional touch point for advertisers and a natural migration of existing pre-show on-screen advertising campaigns that appear in auditoriums prior to the start of the feature film. 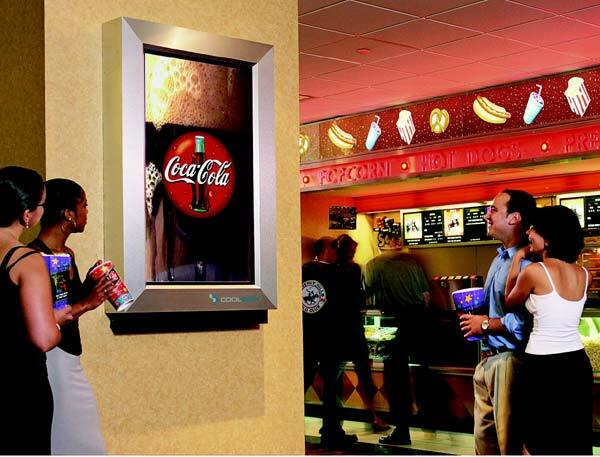 The CoolSign lobby advertising program, although not related to the on-screen advertising is very much an extension of that advertising effort with a different medium (electronic displays) in a lobby-based theater locale. 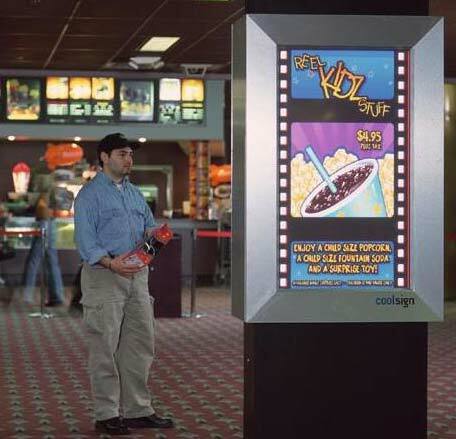 This, in effect allows advertisers a chance to make two separate impressions on movie patrons, one in the lobby, and one on the screen as a pre-show presentation. To create these effective displays, CoolSign employs a series of LG audio-based, plasma screens, in varying sizes from 42 inches to 60 inches diagonal, which are set up in the vertical portrait format. Moving advertising content through the CoolSign Advertising Network is shaped by a hardware configuration which begins with a CoolSign Network controller which manages the ad content and distributes it downstream to each Loew's designated multiplex theater site via a standard Internet link. Content is passed from the controller to an on-site transfer node in the form of a 'hub and spike' set up. Here the transfer node acts as the hub which distributes the advertising content to each individual on-site plasma screen (spoke) which is connected to an on-site player that transmits its ad loop to the plasma screen. Data connections can be over a standard Ethernet or WiFi (at 802.11b) direct to each plasma screen. The transfer nodes are bi-directional and not only accept content data, but also send back proof-of-performance data to the main CoolSign controller. AdSpace oversees the entire Loews CoolSign network from content management to operation of the network. In some instances, the client will supply the finished creative service, in other cases, AdSpace offers their own creative service to provide content for the client. AdSpace accepts the final ad copy (or spots) which they then package together as a specific loop that is deployed to the designated multiplex region it was produced for. All on-site theater displays as explained by Henderson are synched to show the same advertising loop simultaneously. Each theater loop is between three-to five-minutes in length depending on the number of participating advertisers at any given time. The advertising spots that make up the loop are all sequenced together and managed by the CoolSign scheduling program that cycles the loop continually through the theater all day and evening of its operation. As to how an advertiser plugs into CoolSign's 50 theater network depends on a client's specific marketing needs. "Each theater's electronic sign deployment," says Henderson, "can be individually purchased depending on the media planners advertising needs within any Loews's market region served by the CoolSign network." "To keep the advertisexing content up-to-date, the content is usually changed on a weekly or bi-monthly basis. Each new advertising spot is placed in its appropriate loop and scheduled for continuous display. The loop is then automatically transmitted to its designated multiplex (es) where it's then played back to movie patrons upon the CoolSign plasmas." As the film exhibitors continue to modernize their movie theater complexes, the transformation of print signage to its digital counterpart will continue to play a critical part in its customer enhancement services. Digital deployment is reaching into every part of a movie theater's operation as even ticket purchases and car validation kiosk (even more electronic signage). Not even the projection booth is sacrosanct as film projectors are replaced with the high definition video counterparts. As soon as the concession stands are automated, it may be that the only people related to the film industry seen within the theater may just be the people on the screen (but that's another story).